This expansion adds an entirely new game mode to Blood Rage! The Gods themselves have stepped into the fray to aid (or harm!) the various clans as their whims dictate. 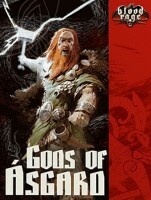 The Gods of Asgard Expansion includes 6 deities from Norse legend, each with their own highly detailed figure and card. Add a Review for "Blood Rage: Gods of Asgard"